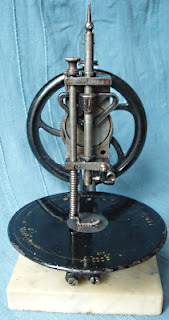 In my thoughts, the sewing machine was an invention of the 19th century, but my research found the first patent for a mechanical needle for sewing was issued in 1755 to a German immigrant, Charles Weisenthal. No mention of a machine goes along with it. Thirty-four years later, an English cabinet maker, Thomas Saint invented what many believe to be the first real sewing machine. 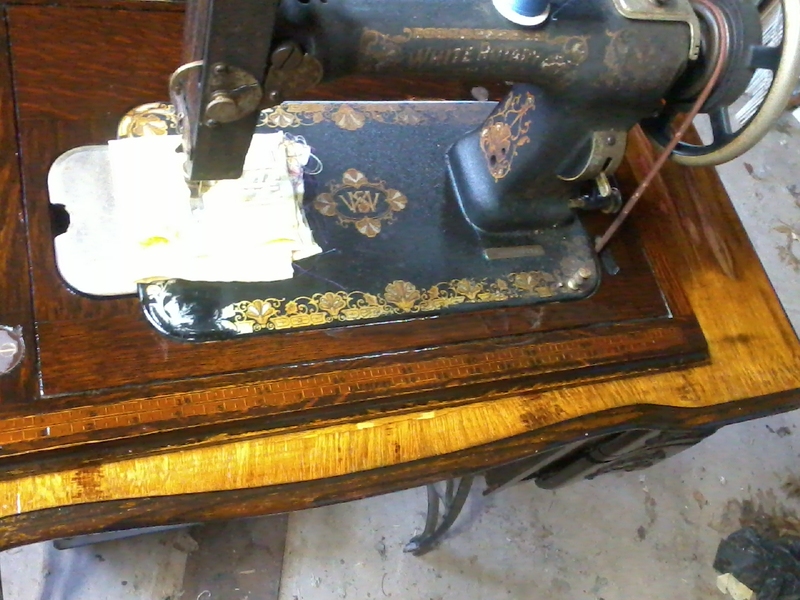 That first machine had an awl which made a hole in leather and allowed the needle to pass through. It isn’t sure whether or not he actually built the machine, but when an attempt was made to make a machine from his drawings in 1880, the machine would not work. No patents were ever taken out for machines until 1814 by Josef Madersperger, but he failed to get all the elements to work together successfully and died without producing a workable machine. Another claimant for inventor of the sewing machine was Frenchman, Barthelemy Thimonnier who was granted a patent in 1830 for a machine using a barbed needle. 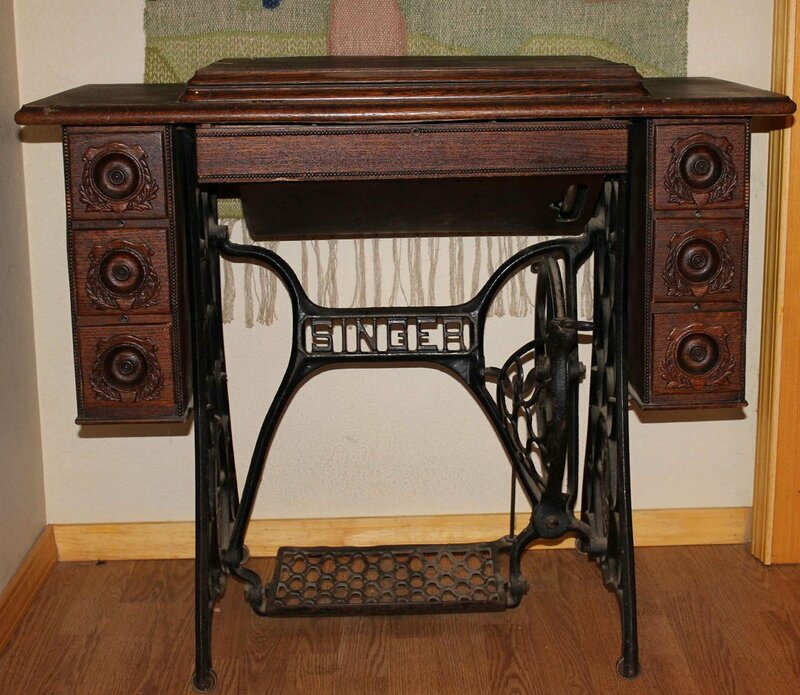 It may have been designed originally for embroidery, but he saw the potential as a sewing machine. By the 1840’s, he had a factory running with 80 machines, but Parisian tailors feared a loss of work, and the factory was attacked and destroyed. 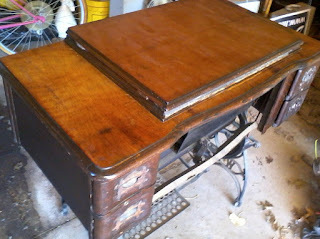 Here are pictures of two of the early machines. Thimommier successfully tried again with a vastly improved machine, but the tailors attacked again. Because France was in the midst of the revolution, Thimonnier fled to England with one machine he managed to salvage. He later died in 1857 in the poorhouse. 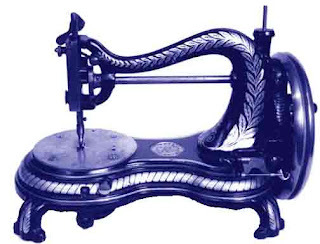 Several other inventors came up with sewing machines. Among them were John Greenough, John Fisher, Isaac Singer, and Elias Howe. 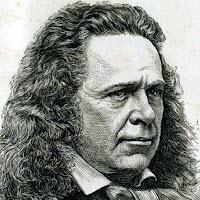 Despite this flurry in the 1840s, Americans claim Elias Howe to be the first inventor in America to invent a machine used exclusively for sewing in 1844. To the right is Elias Howe. practical and efficient one, on August 12th, 1851. Singer is described as a flamboyant and unscrupulous tycoon of American business. His early design evolved into a practical machine which could easily be used by a seamstress. He used mass-production techniques to come up with a machine that could be purchased on hire-purchase system of buying on credit. This revolutionized consumer buying. 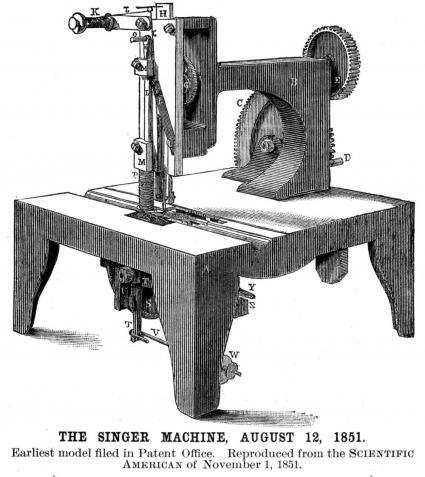 One of Singer's early machines. I'd say we've come a long way from this first machine. manipulate the fabric under the needle. At first for trade use only, the machine later became popular with women who sewed for themselves. in 1953. It belonged to my grandmother who taught me to sew on it. She had it for a number of years before giving it to me. I gave it to my cousin when she went off to college and she still has it today. Today, we have any number of brands making sewing machines that do everything from quilting to embroidery to buttonholes and everything in between as well as plain sewing. Up until about fifteen years ago, I made all my own clothes as well as ones for my sons and my grandchildren. More recently I've helped my daughter-in-law make things for her girls. 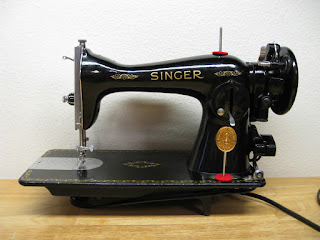 Did you ever take sewing classes or use a sewing machine? Martha loves to cook and experimenting with recipes and loves scrapbooking when she has time. 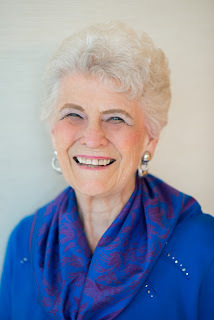 She is the Director of the Houston Christian Writers Conference held in August each year. She has written three series, Winds Across the Prairie and Seasons of the Heart and The Homeward Journey. Her new contemporary series, Love in the Bayou City of Houston and novellas, Christmas Blessing, Love Comes to Bluebonnet Inn, and Garden of Love are now available on Amazon. 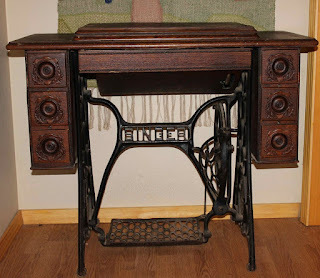 Martha, for years my grandmother sewed on her old treadle machine like the one in the picture. She taught me to sew doll clothes on it. Eventually she got an electric machine and the old treadle machine sat in the basement. When she had to move to a nursing home I was living in California. My mom asked me if there was anything from her house I wanted kept for me before the estate sale and I said the sewing machine. Unfortunately, unknown to anyone she had given it away to a neighbor woman who admired it. I was crushed. I don't know what I would have done with it since I would only use it for decor, but I still think about it from time to time. Interesting article! My grandmother taught me to sew with doll clothes as well, and she had a treadle machine, but sold it to buy an electric one. I loved sewing with her. I know what you mean about thinking of that old machine. Thanks for sharing. O, I adore sewing classic sewing machines! Thanks for this post! Your Featherweight from the 50s has gained a new bunch of fans among quilters. They are wonderful little machines to take along to classes. At one point in time they were bringing as much as $500 because they were so in demand. I am lucky enough to have one (purchased at an auction before the popularity soared) and I use it all the time. Most recently, I took it with me to babysit and my 5-year-old granddaughter and I worked on a doll quilt together. Thanks for a fun post, Martha! Glad to hear that. My cousin says our grandmother's still works perfectly. It's a sturdy little machine. What fun to quilt with your granddaughter. What a great article, Martha! Love the pictures you were able to use! What a sensational post. i really loved it. In fact, you have given a plethora of useful information about sewing machines. There are many home sewing machine reviews that i have seen. But, you have told us the whole history of this invention.